Sterling silver Trinity knot stud earrings are enhanced with Connemara marble along with marcasite stones. Sorry, these Connemara marble earrings are now sold out. 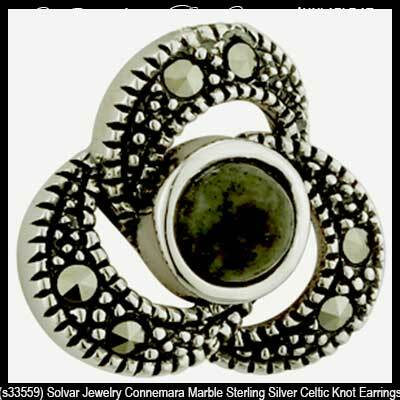 These sterling silver Celtic stud earrings feature a dome of Connemara marble in the centers along with marcasite stones that are studded in the contemporary Trinity knot design that measure 3/8" wide x 3/8” tall. 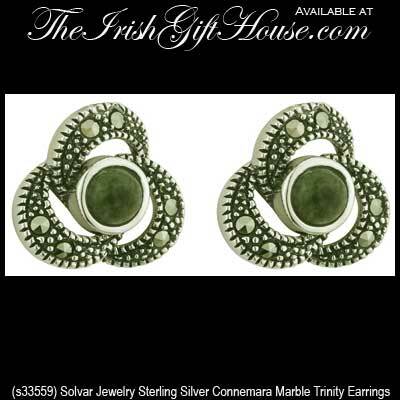 The Connemara marble Trinity earrings with butterfly backs are gift boxed with Celtic knot and Connemara marble history cards, complements of The Irish Gift Househey are made by Solvar Jewelry in Dublin, Ireland.